This is an opinion post, reflecting the opinions of the author alone and not necessarily the rest of the InHub team. So the ‪#‎FeesMustFall‬ and ‪#‎NationalShutdown‬ protest and solidarity action has been gracing the streets of every major university in South Africa, and, as I sit on campus whilst lectures are cancelled, having read opinions from both sides, I'm conflicted, but less so than before. I think part of my conflicting reasoning comes from my cynicism, because my own university has had strike action many times in the past, and, more often than not, the reasons have been silly. Students blamed their own entitlement attitude for the reason they trashed campus buildings and caused more damage than effecting change. This time around, however, the situation seems different. This has momentum, force, and is aimed at the highest parliamentarians in the country. It's more of a logical protest, and this is encouraging. There are some fringe cases to be careful of, however. In this vein, students should protest if they must, but destroying property is not the way to do it. Seeing peaceful protests by students is encouraging in that they're doing it right this time. That quote, by Nelson Mandela, has been ringing in the ears of many South Africans since the time our current president came to power, and we saw an increase in service delivery protests and uprisings of this nature. But it has taken until now, seemingly, to unite everyone against the ineptitude and greed of the ANC government. As far as I'm concerned, such an "uprising" (I hesitate in using 'struggle' rhetoric) has been long overdue and a protest of this magnitude will hopefully finally smack the president and his band of corrupt cadres in the face. So, the government has misspent quite literally trillions of Rands on pocket-greasing nepotism and greed, which could have gone to students all over SA who are facing struggles as fees increase. This is the greatest injustice and this protest justifies this, I think. Students who are within their means academically, should not suddenly be forced out of their studies by a colossal fee increase, which cannot be leveled out by a funding scheme which the government has essentially robbed of its funding. Furthermore, the brutal attacks on peaceful protests, if true, speak volumes about the ANC's ability to control a police force, and I don't know about you, but peaceful protesting should not be met with force. If there is destruction of property and hooliganism, yes, the police must intervene, but not if students are marching with their hands up. Disruption and noise, as far as I'm concerned, does not equate to rock-throwing, car burning and looting (the latter of which certainly warrant police response). I worry simply about the fringe issues; the few that make the protest into something it shouldn't be about. What are those things? Well, the "right" to higher education. Yes, you have a right if you have the ability. If you don't have the financial means, NSFAS or the government should help you. As long as that's held to, this protest will have every ounce of credibility it deserves. Protesters shouldn't erode this by returning to the motives of previous strikes, which were (largely) unjustified. Finally, let's not make this a race issue? It might be, granted, and there are complex issues about past previous disadvantages, and oppression, too sensitive to even bring up here, but it's of paramount importance to unite as all students facing fee increases and push weight against the ANC, regardless of background or race, to get rid of individuals like the minister of higher education, who does this country no good, and the president and his party, who do even less so. Thanks to Fezekile Msimang for the use of his images in this article. Also find him on Instagram. 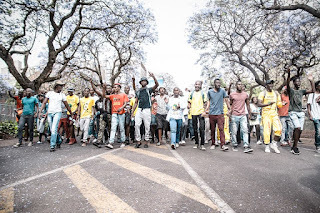 What do you think about #FeesMustFall and the #NationalShutdown? If you're a student, where do you stand? Chime in in the forums at http://forum.inhub.co.za or leave a comment below.